Colorpoint Shorthair is a domestic cat breed that is essentially Siamese except for difference in color of its markings with the latter. The cat originated in the nineteen forties when breeders in United Kingdom and United States set out to develop a cat that resembled the Siamese in every aspect but had points in colors other than the traditional blue, chocolate, lilac and seal. For this purpose the Siamese at that time were crossed with Abyssinians, American Shorthairs and red colored Domestic Shorthairs to produce the ideal result. The new cats were somewhat different in appearance to the Colorpoint Shorthairs of today and were bred several times with the Siamese over the years to produce the elegant feline that we see now. In the early stages of their evolution, they were seen as a pollution of the Siamese gene pool by many cat fancies and breeders and even though they were given formal recognition in the sixties by Cat Fanciers' Association, they are still not recognized as a separate breed by most bodies in the United States and Europe and are considered a part of the Siamese. A lithe and slender cat, the Colorpoint Shorthair has a tubular physique. Coat is short, shiny and looks stunning on its finely muscled body. A number of colors and patterns are recognized for the markings on ears, face, legs and tail, including cream, red, lynx, tabby and tortie variants. Rest of the body is usually in shades of cream and white. Head is triangular with big widely set years and almond shaped slanted blue eyes. Tail and legs are long. A finely built feline, the Colorpoint Shorthair weighs in the range of five to ten pounds. Though healthy animals, Colorpoint Shorthairs share certain ailments with their ancestor Siamese in some of their lines. Amyloidosis of liver is one genetic condition afflicting them. Other is dilated cardiomyopathy even as the incidence of hypertrophic cardiomyopathy is quite low in this breed. They also are prone to gum and tooth disorders and require periodic dental assessment. 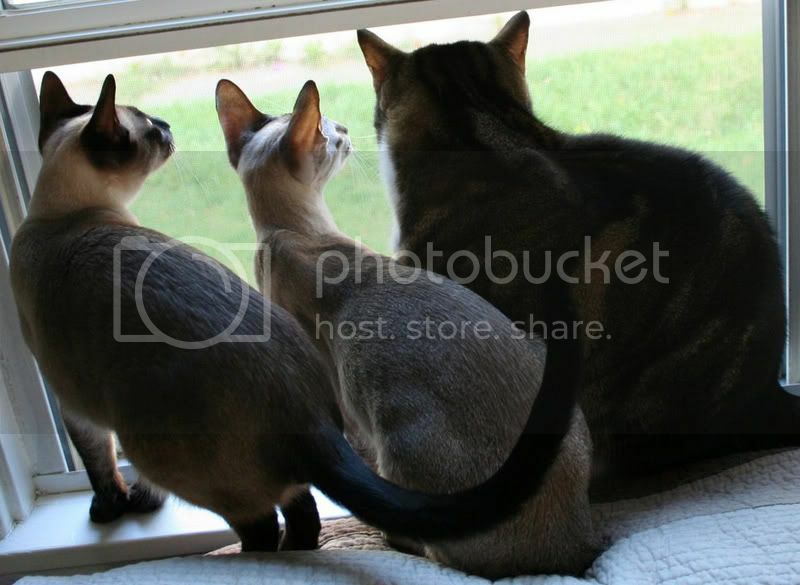 Intelligent and active cats, Colorpoint Shorthairs are very lively and energetic. They spend the majority of their time playing with their toys and supervising household affairs. Sightly less vocal than the Siamese, the Colorpoint Shorthairs are quite expressive nevertheless, and are not shy to communicate their feelings in frequent meows and yowls. They are sensitive and dedicated to their humans and expect equal interaction and commitment from them. Completely people-oriented, these graceful cats make ideal companions for loving and attentive families around the world. Hmm, interesting! See I guess you might consider me one of these because of my coat color. However I'm a registered Oriental Shorthair in the US but in the UK I'd be Siamese. Its crazy stuff!! All I know is I'm super duper vocal, much more than Latte! Colorpoints are amazingly smart creatures. Sir John, our colorpoint cat was a special cat and we loved him dearly. My kitten is incredibly active. It's even more like a little tiger, I guess. Nice article. Thank you!